NASA is asking scientists for ideas about new ways to use its Kepler space telescope, whose planet-hunting mission was stalled by a malfunction three months ago. 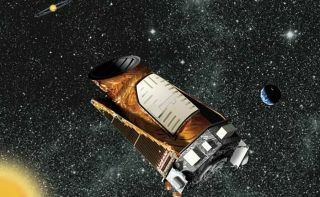 The space agency issued a call for new mission proposals on Friday (Aug. 2) to help prepare for the likelihood that Kepler will never fully regain its health, which was compromised in mid-May when the second of Kepler's four orientation-maintaining reaction wheels failed. This robbed the instrument of its precision-pointing ability. The main goal of the $600 million Kepler mission is to determine how commonly Earth-like exoplanets occur throughout the Milky Way galaxy. The spacecraft detects alien worlds by noting the tiny brightness dips caused when the planets pass in front of their parent stars from Kepler's perspective. The observatory needs three functioning gyroscope-like reaction wheels to perform this precision work. The spacecraft had four wheels when it launched in March 2009 — three for immediate use and one spare. But one wheel, known as number 2, conked out in July 2012. And then number 4 failed on May 11 of this year, bringing Kepler's exoplanet hunt to a halt. Over the last three months, engineers have been working to recover at least one of the failed wheels. The engineers have had some success, getting both of them to spin in the last few weeks. However, both wheels still exhibit much higher friction levels than a healthy wheel would. "The team anticipates beginning the pointing performance testing on Thursday, August 8, 2013, and will continue into the following week if all goes well," Hunter wrote. "A determination of whether Kepler can return to exoplanet data collection is expected a couple weeks after these pointing tests are complete." Sending astronauts out to fix Kepler, as was done five separate times with NASA's Hubble Space Telescope, is not an option. Kepler orbits the sun rather than Earth and is currently millions of miles from our planet. The odds that Kepler will recover fully and resume its previous operations are not great, mission team members say. "It's not going to go back to its original mission; it's going to be something less than that," Kepler deputy project manager Charlie Sobeck, also of NASA Ames, told SPACE.com late last month. "But how much less, and how much usefulness it'll have — it's really still very much up in the air." So NASA and the Kepler team have begun to think about possible alternate missions for the spacecraft, which is why they made the new request for ideas. Proposals are due by Sept. 3. The Kepler team will spend two months reviewing the suggestions, then submit an initial report to NASA Headquarters by Nov. 1. An official proposal for a repurposed Kepler is slated to be completed by Feb. 1, 2014, with a decision about funding expected shortly thereafter. The new science mission would then begin in the summer of 2014, if all goes according to the currently envisioned plan. "If an appropriate science case(s) and cost envelope is found, the repurposed mission will continue to be operated out of NASA Ames Research Center and make use of the nominal mission project office personnel and expertise already in place," the request for ideas states. Whether or not Kepler can resume its planet-hunting activities, scientists will likely continue pulling new alien worlds out of the mission's huge dataset for several years to come. "Some of these new planet candidates are small and some reside in the habitable zone of their stars, but much work remains to be done to verify these results," Hunter wrote. Kepler's prime mission life was pegged at 3.5 years, and the spacecraft has about four years' worth of data under its belt. So it's likely the mission will be able to accomplish its main goal, ultimately determining how commonly "alien Earths" occur around the Milky Way, team members have said.